I must say the dismal drab grays and browns provided by our weather lately are not my favorite color combinations. So, today we are taking a sneak peek at a cheerful seaside house on the cover of March’s House Beautiful, where beachy colors set the tone for a fresh young redo. Inspired by the shoreline locale, designer Lee Ann Thornton chose the perfect palette for her clients’ charming Dutch colonial in Old Greenwich. It certainly helped that their favorite color is blue but combining it with rich mahogany, driftwood neutrals and pops of purple and orange, the house is anchored in the colors of the natural world with accents like floral bouquets. The living room above, is painted in a custom blue that is crisp and clean during the day yet elegant and serene at night. Like so many others, the clients loved the look of Diane Keaton’s beach house in Nancy Meyers’ Something’s Gotta Give. And it was that level of sophisticated yet liveable casual chic that Thornton emulated. The blue, natural and mahogany tonalities continue into the kitchen where Farrow and Ball’s popular Borrowed Light sets an airy tone. I’m a sucker for a banquette and the warm saddle color of the leather on the cushions is actually a wipeable faux, perfect for this young family with three children under the age of three – Thornton is known for her ability to balance luxury and practicality in just the right doses. 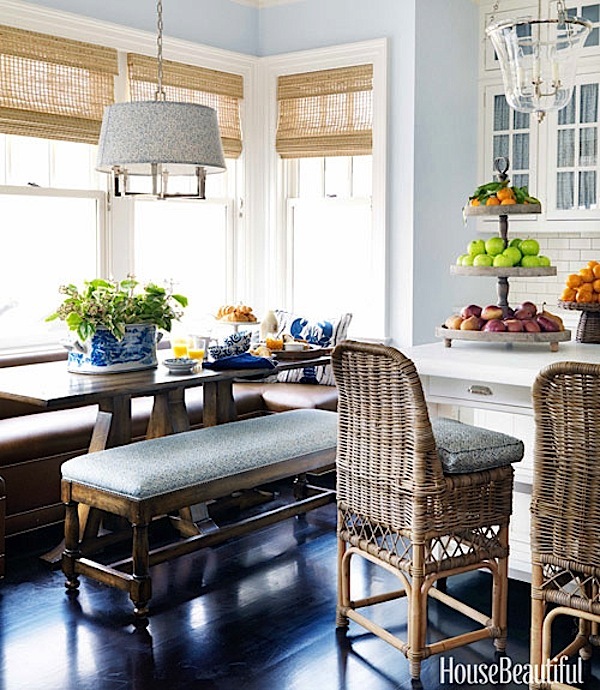 A light blue patterned fabric softens the glass cabinet doors and also appears on the bench, light fixture and bar stools, adding a homey touch and tying it all together in a subtle fashion. My favorite room, however, is the master bedroom, where the addition of a rich burnt orange adds another layer. The entire issue is all about perfect color combinations and throughout the magazine color expert Kate Smith offers insight on what these color combos say about those who love and live with them. Evidently “optimistic orange boosts emotional energy” and in combination with the soothing mineral blue is the perfect balance – well I always knew there was good synergy between those two!! The continuing theme of natural wood tones is used effectively with the fantastic addition of the fabulous Mecox Gardens oak lantern. Its anchoring scale and geometric lines contrast wonderfully with the sinuous curves of the custom bed. 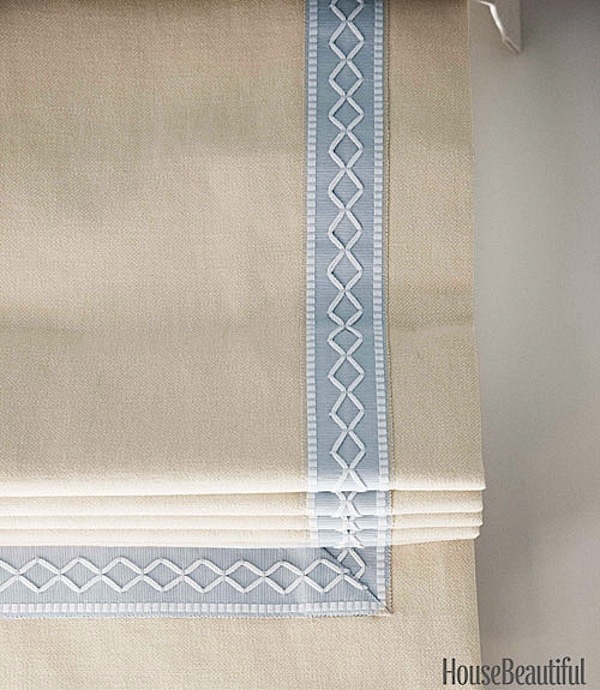 Pretty details such as the Samuel & Sons Oxford Border on the roman shades above make all the difference. 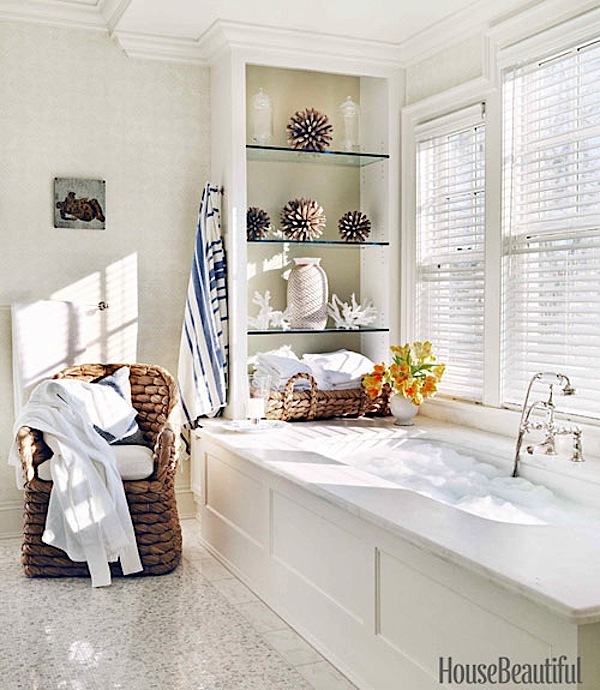 And in the light filled master bath, the chunky basket woven Ralph Lauren Joshua Tree chair adds the same element of driftwood rustic chic against the crisp blue and white stripe of the towel and the textured Stark Princess Najwa grasscloth on the walls. I hope they continue to keep those orange poppies by the tub – they are the perfect color segue from the bedroom! I can’t wait to see the rest of the issue to get a dose of upbeat color and to read what else Kate Smith has to say about the colors I love! This entry posted in furniture, interior design. Entry Tags: House Beautiful, Lee Ann Thornton Bookmark the permalink. Thanks Stacey, lovely post. Somethings Gotta Give decor lives on! I can’t wait to get mine – just love the soothing colors and oh my, the bathroom…heavenly! Thanks for the great preview of the March issue of House Beautiful. I’m as excited to see it as you are. I was so thrilled to be included! lovely glimpse and the rooms feel so light and fresh. Fun to have Kate Smith’s take on the color and personality. Thanks Stacy. A soothing palette throughout the house makes for a comfortable living experience. Thank you for the preview and for the view from Kate Smith. 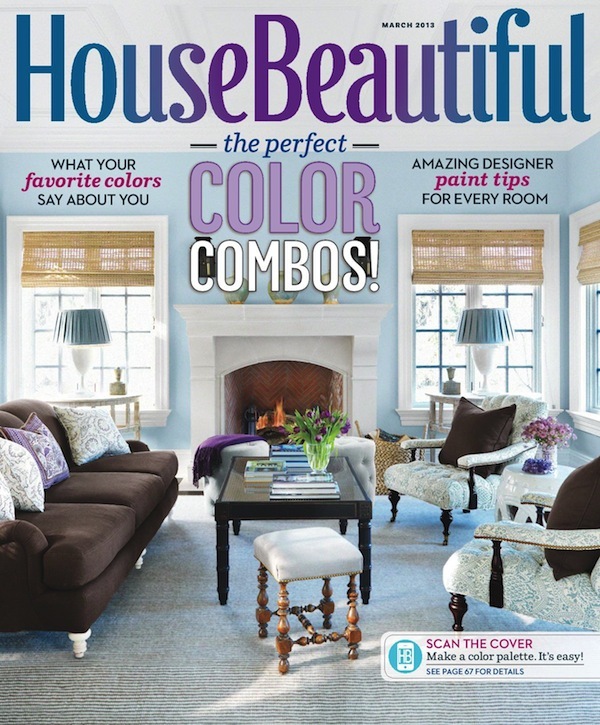 I am counting the days until my March issue of House Beautiful arrives. How lucky we are being able to preview this lovely house and the view given by Kate Smith. wow! i think this is jack and morgan melnikoff’s house. beautiful! Does anyone know where I can get a similar duvet to the one pictured? John robshaw for the duvet. And yes, that is morgan melnikoff’s house in old greenwich. I’ve been in it! I’m in love with the neutral roman shade with the blue border! Would be perfect for my nursery! Was it custom or bought? What fabric was used? Could someone please tell me the paint colors used in the kitchen and master bedroom? So beautiful. 81 queries in 0.435 seconds.